We developed an E-Clinical and Tracking System that allows students in Ngee Ann Polytechnic's School of Health Sciences to select Clinical and Hospital Attachments of their choice. 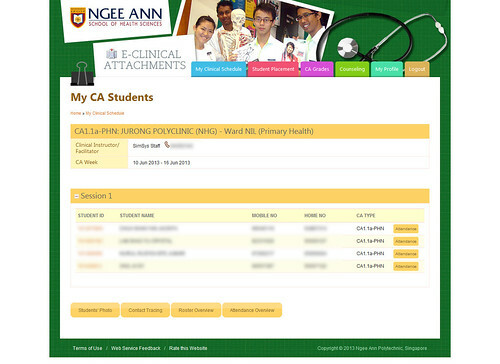 We developed an E-Clinical and Tracking System for Ngee Ann Polytechnic’s School of Health Sciences. The HS-eCSTS system is a Clinical Selection and Enrolment system that allows students in the School of Health Sciences to select Clinical and Hospital Attachments of their choice. This is much like O-Level students making a selection of the tertiary schools of their choice. The system makes placement allocations based on student selections, allows administrators to set the rules and configuration for each semester as well as manage and edit the posting allocations. With this system, each student is allowed to make a selection of up to five Clinical and Hospital Attachments of their preference and set the preferred ranking order. At the start of each Semester, administrators are able to setup and configure the rules for each attachment. Rules include Nationality, Gender and Race ratio rules, Student Level Requirements and Gender Requirements. Based on the rules set by the administrators and the preference set by the students, the system shall automatically determine and assign attachments for the students to the respective clinical departments. Other features in the system include reports and dashboards to detail attachment outcomes and student attachment reports etc. Additionally the system also includes a management function to track the attendance of each student’s participation, conduct reports as well as their keep track of student attachment grades.